A group of Senate Democrats who wrote to the administration demanding action on new railway safety measures was called out by the Department of Transportation for blocking the confirmation of the man tapped to head the agency tasked with railway safety. The letter from Democrats, co-signed by Senate minority leader Chuck Schumer (D., N.Y.) and 14 colleagues, demanded answers from DOT secretary Elaine Chao on the implementation of positive train control (PTC) technology shortly after last month's deadly derailment in Washington. The senators asked for "vigorous" action on PTC and stressed a fast-approaching deadline to implement it. DOT concurred with the senators on the importance of PTC implementation but slammed them for blocking the nomination of Ronald Batory, who was unanimously approved by members of the Senate Committee on Science, Commerce, and Transportation shortly after he was nominated to be federal railroad administrator last summer. The agency wrote that "concerns about rail safety and implementation of PRC are important ones," assuring they had the "full attention" of the Federal Railroad Administration, and added that the Senate could help by ending its obstruction of Batory. "In the meantime, we cannot overlook the disturbing fact that the Federal Railroad Administration remains without a Senate-confirmed Administrator during this very critical period," wrote a DOT official in letters delivered to each of the senators on Tuesday. "At a time when PTC implementation is so important, we believe having a confirmed administrator should be a priority for the United States Senate." 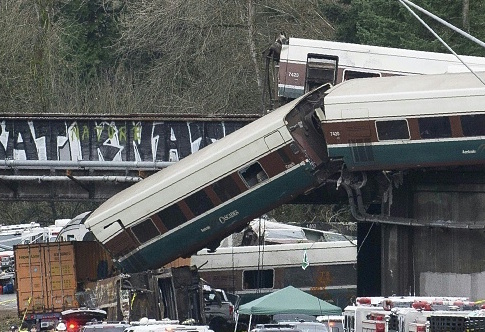 "In the wake of the terrible rail accident in Washington State, Ron Batory needs to be confirmed as Federal Railroad Administrator as soon as possible," the letter concluded. The opposition to Batory, a former president and chief operating officer of rail industry giant Conrail with over four decades of railroading experience, has nothing to do with his qualifications. Schumer has openly stated he will work to block votes on Batory and other DOT nominees until the administration pledges billions of dollars in funding for a major tunnel project in New York. He most recently blocked a confirmation vote on Batory on the last day of the 2017 legislative calendar, just days after signing the letter urging action on PTC. Requests for comment sent to spokespeople for each of the 15 senators were not returned. The criticism of Schumer and his Democratic colleagues is coming not just from DOT, but also from Republicans working to get Batory confirmed. A spokesperson for Sen. John Thune (R., S.D. ), who chairs the Commerce Committee and scolded Schumer on the Senate floor after his last objection to a vote on Batory, said Democrats are "hampering efforts to enhance railroad passenger safety." "Blocking this qualified nominee in order to extract commitments on a multibillion-dollar project is a deeply cynical maneuver hampering efforts to enhance railroad passenger safety," said Fred Hill, communications director for the committee. "It should not take a deadly accident to underscore the importance of filling a critical federal transportation safety position with a nominee who already has bipartisan support," Hill said. The Trump administration has made no indication it will give in to Schumer's demands for tunnel funding to get nominees confirmed. This entry was posted in Politics and tagged Department of Transportation, Senate Democrats. Bookmark the permalink.